There were a number of key themes from the recent Temenos Community Forum (TCF), held in The Hague. Under the overarching message of “making banking better”, which was outlined by CEO Max Chuard in his opening comments, he said it was what binds the community together as it is at the heart of what Temenos is. This was Chuard’s 17th TCF this year but his first as CEO of the banking tech company. It is arguably due to the success of this fast-growing but closely-knit community that Temenos has become one of the world’s top banking software companies. This year’s forum had over 2,000 attendees from over 114 countries – the biggest one yet. “From my first TCF in Barcelona with just one hundred people to nearly 2,000 people in the room today we have grown considerably,” observed Chuard. The theme of the event this year was: Digital Banking Reloaded. Chuard said: “We all share the same goal, to use technology to revolutionise banking. Our industry is at a time of change. We have more technology at our fingertips that ever before, opening up unlimited possibilities. Whether these are APIs [application programming interfaces], cloud or artificial intelligence – all of these create a need to move faster. There is no doubt that Temenos’ rapid growth recently has given its competitors serious food for thought. Chuard maintains that no other vendor has the winning combination of both functionality with cloud native, cloud agnostic technology and the ability, through packaged software, to keep it simple to deploy and scale. Some of the legacy vendors suffer from product overlap and have to manage more than ten different operating systems serving multiple industries. Since technology is moving so fast, running customised legacy software, which cannot be easily upgraded, is a luxury the banks cannot accept without deep consequences. It is the case, Chuard pointed out, that many legacy vendors are not agnostic. They are not multi-cloud and they do not provide the packaged approach that Temenos offers and which avoids the problem of multiple software versions all needing separate upgrades, he claimed. What Temenos has to demonstrate is can its packaged approach continue to provide functionality and the increasingly complex end-to-end solutions? Temenos seems to have the edge since banking is what it concentrates on. Whether Temenos actually is, as it claims – “at least ten years more advanced than anyone else in the market remains to be seen” – remains to be proved. The Temenos approach has given smaller banks and challenger banks an edge and helped them reduce their time to market, operational complexity and cost. The vendor also has a considerable library of APIs available through its portal which, it claimed at the event, will become the de facto standard for banking software integration. Temenos Infinity (digital channels front-end) and Temenos T24 Transact (core banking), states the vendor, leverage 25 years of functionality from 3,000 banks in over 150 countries with advanced cloud-native, cloud-agnostic, API first technology and design-led thinking. 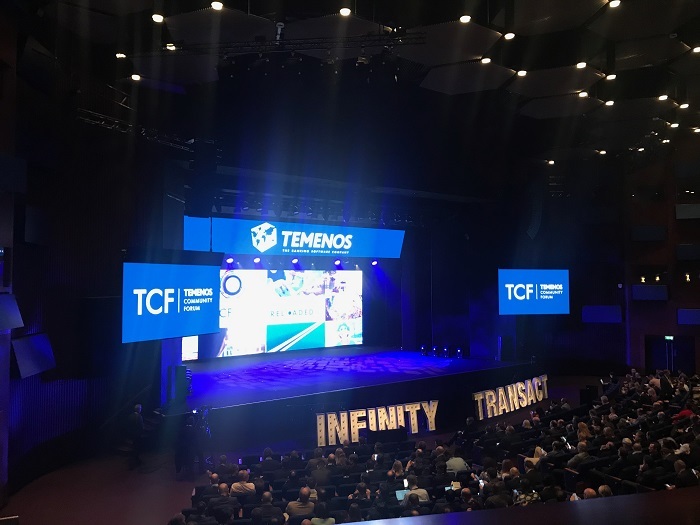 Temenos Infinity was first outlined at the TCF event in 2018 in Dublin. It is an independent, omnichannel digital banking product which helps banks transform multiple siloed banking channels and legacy applications into a fast, consistent, frictionless customer journey. It incorporates the customer onboarding solution from recently-acquired Avoka. Rubi Walia, head of digital banking at HSBC US, took to the stage at TCF to share the bank’s experience of implementing Avoka’s tech and the results. The solution, now branded Temenos Infinity, helped HSBC US launch a new credit card product in four months. “We were high-fiving in the corridors, feeling like a fintech start-up!” Walia recalled. The number of announcements TCF were not just client wins (PASPX in Denmark, Truevo in Malta, and three banks in Finland) – they reflected a company that is not only growing but innovating at the same time with confidence and a firm belief in a clear strategy. Uniting Financial Services (UFS) has signed for a range of Temenos’ cloud-based solutions. Infinity and T24 Transact will update the bank’s systems. T24 will support PayPal’s operations in the US, UK, Germany and Australia. The 13th largest bank in the US pivots for digital era.